little too, and the rose color in her cheeks brightened. “We are not allowed to say what we think,” said the gentleman, while the rest laughed more than ever. So there you have it. The name Hodgson Burnett might sound familiar: she was the writer of A Little Princess (1905) and The Secret Garden (1911). 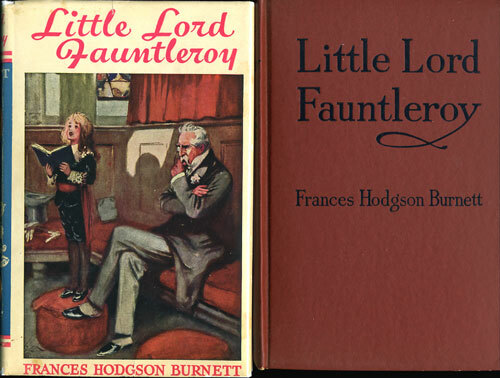 Little Lord Fauntleroy was a much earlier work: it was published in 1886. I found the book to be an unexpectedly good read; it was very enjoyable, funny at times, and with a great and amusing use of language. It was so engaging even that I finished it in less than a day. You can read it online here. An interesting fact is that this book, just like Goethe’s The Sorrows of Young Werther, influenced fashion. Little Lord Fauntleroy’s velvet suit with a white collar and his soft curls are mentioned often in the book, and apparently started a fashion (mostly with mothers of young boys) for little suits and pincurls for boys!